I was at the stage where I was becoming increasingly frustrated with my own efforts, probably becoming aimless and I was impatient to get my hands on better trees to work with. In August 2004, after much deliberation and at least 10 trips to his stand over an August weekend, I purchased the Japanese White Pine pictured below from Ken Leaver of Windybanks Bonsai at the annual Broadlands Craft Show in Hampshire. The tree was a Japanese import, stood around 14” high (36cm) and was estimated to be about 12 years old. Ken Leaver helped me select it from 3 similar trees and recommended this one due to the well-developed trunk base, overall shape, unobtrusive graft and good branch arrangement. So here I was with my first £100 tree and not a clue what to do with it. I began badgering a local Japanese White Pine owner I had met via the Garden Web Bonsai Forum (Richard Fish) for help and advice. Fortunately he was very patient and it was also fortuitous that Richard was taking lessons at the time from Nobuyuki Kajiwara – a well known sensei on the European bonsai circuit - who as I discovered subsequently, had also trained Ken Leaver of Windybanks Bonsai in White Pine care. We used to rendezvous in the car park of a local community centre ridiculously early on Sunday mornings before the lessons and I’d help Richard, Nobu san and the students carry their trees inside whilst picking up what advice I could from all and sundry for free. A bonsai groupie no less! Acting on advice, the first thing I did in August 2004 was prune off the very vigorous shoots from branch ends to see what I had and open the tree out for a good look. I also embarked on a quite sparing watering regime – probably no more than 3 times a week in the deep training pot and also began using rapeseed cakes as fertilizer with a roughly bi-monthly dose of half strength Miracid. Following the advice I was receiving second hand from Nobuyuki san via Richard Fish, I started to really examine the tree in Oct 2004 with a view to coming up with an initial pruning and development plan. There was no doubt in my mind that at least one of the bottom two branches would have to go. Although these branches were very well developed (see below) they were essentially sacrifice branches and had served their purpose in thickening the lower trunk. Even if the tree ended up being shorter, the bottom left branch (below) was certainly too low to meet the convention of it being one third of the way up the tree which was part of my understanding of bonsai design. By this time I had also moved the tree into a plastic pot and surrounded it with 50:50 medium akadama and grit without disturbing the original root ball to allow for free drainage during the very wet English winter. It is perhaps prudent to outline my understanding of the Kajiwara Method for Japanese White Pine development at this point. In brief terms, he advocates no full scale candle pinching in spring or summer and allows free vegetative growth. Then around November you prune off strong, unwanted new shoots to allow the weaker shoots further back on the branch to develop. This is the finer “Bonsai Growth” you are trying to encourage in this methodology. The provisos being that you don’t do heavy pruning on a branch that you wish to lengthen and thicken or remove all the foliage from any one branch. You then balance development of the tree by pulling more needles from stronger areas and less from the weaker areas that need to be strengthened, leaving the buds(at the base of the needles) intact. Initially I found the idea of actually pulling needles off the tree to promote new growth (via back buds) hard to grasp but did as I was advised and pulled a few needles from the bases of the strongest shoots that remained. Following this advice I pruned off all the surplus strong shoots at the branch ends, taking care to leave weaker buds in the interior of the branches intact. The following picture by Richard Fish illustrates the principle showing strong shoots that could be pruned off depending on what your intentions are with the particular branch. By November 2004 the tree was virtually unrecognisable and in a new pot. It showed good taper and had about 7 or 8 main branches in position at strategic points around the trunk that diminished in size nicely towards the top. During what was an exceptionally wet winter, I actually tied heavy plastic around the tree trunk and pot as a raincoat at one stage. I remember placing a “Dear Abby” type post on Garden Web seeking advice and I was advised to be patient. Sure enough by the end of April, tiny buds began appearing that then developed rapidly into candles by mid May 2005 (see pics below) with the result that the tree began to fill out nicely. Having successfully overcome the major hurdle of (as I thought) using and abusing the tree for 8 months, with it then surviving and indeed thriving, I started to look at it in more detail. The current planting angle and branch arrangement was clearly unsuitable as shown in the picture on the left below. It looked much better turned almost 180 degrees as on the right. Then in late June 2005 after much deliberation I decided to re-pot the tree. The tree was strong and logic indicated that a tree in good condition should be able to take at least light duty treatment of this sort mid-way through the growth cycle. By June the tree looked even better to me from the new angle. This decision to re-pot was based as much on my own impatience to do something with the tree as it was on USA bonsai artist Vance Wood’s writings on the benefits of summer re-potting of Mugo and Scots pines on the Bonsai Talk Forum as well as consultation with local bonsai outlets. This sort of work is possible in mid-summer as certain pines have a semi dormant period when, in simple terms, they take a breather to gather strength for the late summer growth spurt in preparation for winter. Summer re-potting is not a thing to be undertaken lightly and I would only recommend it if you are sure of how the species will react and confident in your abilities. Some trees may benefit but you may kill many others. Conventional wisdom says June is a bit early as well, with July into August being better in many peoples’ opinion. The tree was re-potted in a round speckled pot using about 60% of the old soil to incorporate as much of the fluffy fungus as I could and 40% fresh, medium akadama. The tree was wired into the pot securely and the soil surface was mossed for the following photograph that was posted on Garden Web Bonsai Forum and later on Bonsai Talk Gallery. Clearly I was feeling quite pleased with myself at this stage. But at the same time I was slightly paranoid to say the least that I might have gone too far this time. A quote often heard that “You’re not a true bonsai person until you’ve killed at least one good tree,” kept echoing in my head. In hindsight I had created an amorphous green triangle in a totally unsuitable pot but at least it had a good trunk and some potentially well placed branches. I had studied the tree, made something of a design plan, acted on it and executed it instead of just looking after it like the “arboriculturalist” I had been until this time. 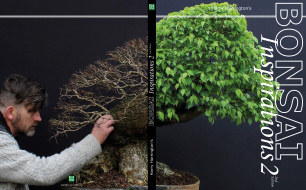 During 2005 I started participating on The Bonsai Site Forums and began discussing the tree with Harry Harrington amongst others and took much of the advice I had been given on board. In November when the annual “prune and pluck” phase came around again, I re-wired the tree to try and improve the shape by bending the first left branch down and trying to work some movement into the very stiff looking back branch visible at the bottom right below. From the side it stuck out like a frying pan handle! My needle plucking was again very tentative as I felt the tree had been through a lot that year. I applied guy wires attached to screw eyes in the trunk to pull the branches down further in an attempt to age the appearance and tried to arrange the foliage into pads. This wasn’t very successful as you can see below. During March and April 2006 I made it my business to find out all I could about the mysterious Japanese White Pine with a view to really trying to crack this tree later in the year. I spoke to vendors, bonsai teachers and searched every website I could find for insight. I published the findings – which weren’t particularly startling or conclusive - in the form of a survey on Bonsai Talk Forum. Most of the information I had found re pruning and candle pinching of Japanese White Pines was vague and contradictory in fact, so I resolved to stick with my original method of not doing any general candle pinching at all. The tree was fertilised heavily in early April with slow release Osmocote cones and rapeseed cakes along with the bi-monthly dose of Miracid. It responded with a massive flush of new growth in mid May right on schedule. The tree suffered a sustained sparrow attack in June which resulted in the tree nearly being dug out of its pot and some root damage which necessitated an emergency re-pot. I used a matt brown oval pot I had bought as a possible final pot for the tree. (The tree now has a permanent screen of heavy duty drainage mesh over the soil to protect it from any future attacks).